The sad, high-calorie desk lunch should be a thing of the past. The Cobb Your Enthusiasm salad from Evergreens. In a perfect world, maybe we’d all make Mason jar salads for the workweek every Sunday, with the dressing on the bottom so nothing gets soggy, and every lunch would be a Instagrammable photo of nutritional bliss. (Remember those forgotten resolutions of January?) But life’s not always that predictable—and besides, with so many choices for greens to go in Seattle, eating well on a weekday is a snap. Who knew eating virtuously every day could be so delicious? 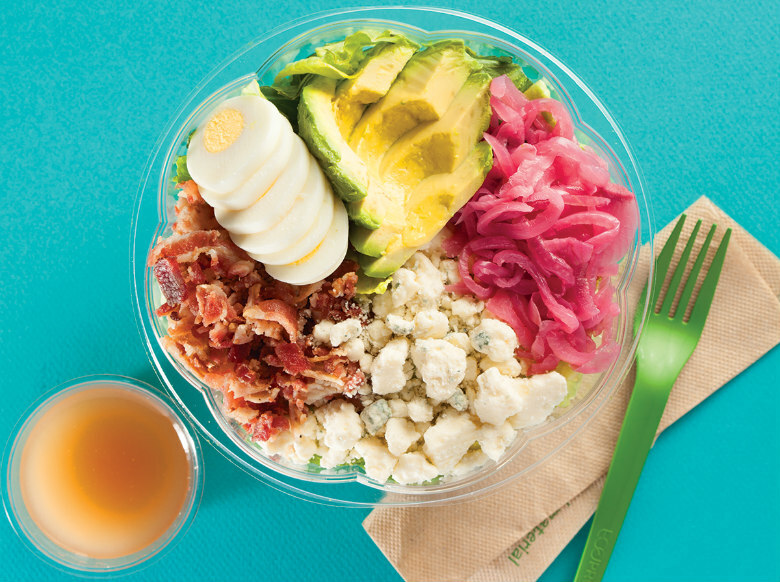 It’s nice that Evergreens, the locally grown, booming fast-salad concept, lets you choose from a salad, a wrap or a grain bowl—and really, they’re all quite healthy. We love the Mexican-leaning El Sombrero salad ($9) and the Cobb Your Enthusiasm ($9), but the romaine lettuce in these doesn’t hold up for more than about 20 minutes—so the longer you anticipate your wait to be before eating, the more you should lean toward getting your grains. Multiple locations; Pickup, lunch and dinner. As an early entrant in the race to satisfy downtown Seattle’s lunchtime salad cravings, Sprout, in the base of Smith Tower, solidified its spot on the build-your-own podium with its dressings, which range from coconut curry to sesame soy Sriracha to apricot Dijon. Salads tend to be dressed on the lighter side here, so if you like a lot of dressing on your salad, say so. Pioneer Square, 512 Second Ave., 206.973.3766; South Lake Union, 501 Fairview Ave. N; Pickup and delivery, lunch and dinner, closes at 6 p.m. The Sweetgrass Thai kale salad ($9.95) is an unfamiliar combination of flavors—hippie kale, edamame, legit Thai spice—but with that flurry of cashews, it tops the list of satisfying mega salads that do a body good. And because kale holds up well, it’s the perfect thing to pick up when you don’t know when you’re going to get to lunch, but want to eat something you won’t regret. Ironically—or not?—the real reason we go back again and again is for the buckwheat snail cookie ($2.75), which is essentially a dome-shaped buckwheat brownie. Use Sweetgrass’ slick online site to order, and you can pick up your salad or smoothie in a small fridge to the right of the registers. Downtown, 1923 Seventh Ave.; 206.602.6656; Pickup and delivery, lunch and dinner. Casual and quick, this U-District spot draws college crowds for being both inexpensive (nothing on the menu tops $11) and delicious. And the cuisine here—Saigon-style street eats, from pho to banh mi—is intrinsically healthier than the plentiful burger and burrito options nearby. Pick your protein (both the pork meatballs and lemongrass grilled chicken are excellent) and your preparation; we particularly like the vermicelli noodle bowls ($8.45–$10.40) for a light meal big on flavor, thanks to plenty of pickled veggies. University District, 4725 University Way NE; 206.456.7192; saitownseattle.com Pickup and delivery, lunch and dinner. Vegetable mezze platter, carrot bi tahini, muhammara & green herb hummus, arugula, turnip pickle brine, mamnoon GF crackers with beet-pomegranate juice. Mamnoon’s little sister, located at the base of one of Amazon’s downtown buildings just north of the Spheres, bills itself as “a modern union of juice, food and life.” Look beyond the bespoke hammered brass tables, the pretty tile and the Turkish coffee, and you’ll see an opportunity for clean food on the run; good travelers include the vegetable mezze platter ($9), which comes with the muhammara and carrot bi tahini that made you fall in love with Mamnoon in the first place. Bonus: Anar is open for breakfast, so if you need to pick up fixings for breakfast and lunch before your day actually starts, grab a date bar ($3.50) and the beet-pomegranate juice ($7) to go, too. Belltown, 2040 Sixth Ave.; 206.453.4654; Pickup and delivery, breakfast, lunch and dinner, closes at 6 p.m.
Tuna bowl and scallops poke bowl. Though it’s called a poke bowl ($10.99), this neighborhood fishmonger’s takeout sensation is more of a divided rectangular tray: scallion-flecked fish on one side, furikake-topped rice on the other. You can order sides such as kimchi and seaweed salad, which get piled somewhere in the middle, but this is not party-in-a-bowl poke. And the simplicity is why we like it. Order the shoyu tuna and eat it while the rice is still warm. Central District, 411 23rd Ave. S; 206.485.7388; seattlefishguys.com; Pickup, lunch and dinner. Born from a cancer-fighting diet change by the owner’s family, HeartBeet, which bills itself as an “organic superfoods café,” makes it awfully easy to consider going vegan. Described with cheerleader-like enthusiasm, satisfying salads and warm grain bowls, such as the Buddha bowl (“experience inner bliss”), are indeed “so yummy you might cry” ($10.99). Don’t forget the Coconutty smoothie ($8.99). Roosevelt, 1026 NE 65th St.; 206.525.0300; heartbeethealthy.com; Pickup and delivery, lunch and dinner. Hard-core Seattle foodies aren’t super keen on national franchises (unless, of course, they’re cult favorites, new to town), but MOD is a hometown success story. MOD stands for “made on demand,” which is why, mom-and-pop preferences notwithstanding, the now-international design-your-own-pizza joint appeals both to kids, who can’t resist the allure of peeking across the toppings bar to choose specific ingredients for their pizza—and to adults, who can customize a salad without paying more for extra ingredients. (Want extra chicken? No problem.) Go for a 6-inch mini pizza and a salad ($5.47 each). Best topping: Mama Lil’s pickled peppers. Multiple locations; Pickup, lunch and dinner. The curried quinoa salad ($6.95) is light and virtuous, with just enough almond butter dressing to take the lunch to go from rabbit food to a legit meal. Pair it with a ginger-forward Carrot Zinger juice ($7.95) and a cacao-almond energy ball ($2.50), and you might find yourself leaving work early for a SoulCycle class. Workout tights not included. Multiple locations in Seattle and Bellevue; jujubeet.com; Pickup with delivery at some locations, lunch and dinner (hours vary). Seared tuna with miso deviled eggs and pickled vegetables; Bento Box. Uwajimaya’s new South Lake Union outpost—part fish market, part Japanese deli, part pan-Asian grocery—is good for satisfying all tastes. Bring home a bucket of spicy salmon poke ($23.99 per pound) from the poke bar, dig through the sushi offerings or pick up tuna onigiri for a quick, healthy snack. South Lake Union, 400 Fairview Ave. N, P001; 206.957.1060; kaimkt.com; Pickup and local delivery. Although Tom Douglas’ most daring foray into Asian food doesn’t package its bento lunches in those pretty red lacquered boxes if you’re on the run, the idea remains appealing as a takeout option: Eating perfectly seared tuna or salmon with rice, miso deviled eggs, various pickles and greens ($14–$18) at one’s desk feels both healthy and indulgent. For good measure, splurge on a Mekong coffee, which is Vietnamese coffee with orange peel ($5). Downtown, 2121 Sixth Ave.; 206.812.8412; tanakasanseattle.com; Pickup and delivery, lunch and dinner.